Around this time last year, Adam said, “I need you to make me something to impress my date with.” Wait, what?? 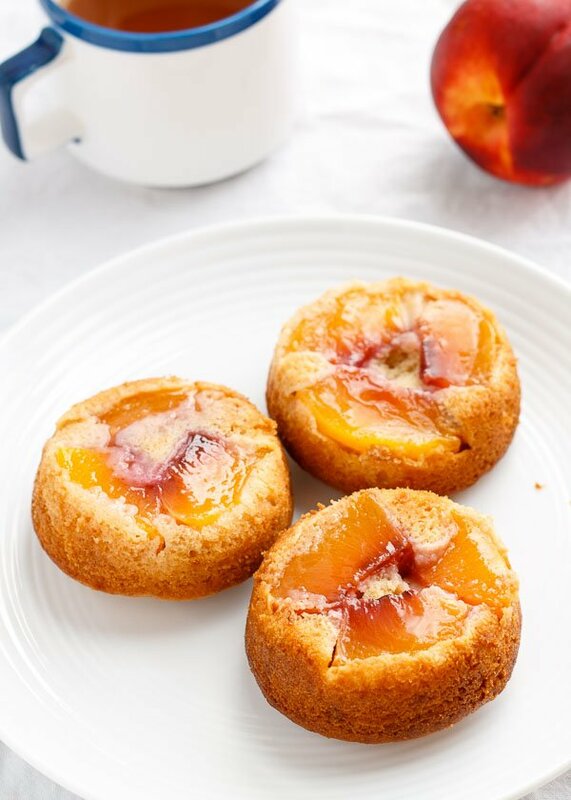 “But it’s gotta be something she’ll believe I made.” Insert skeptical face here… After brainstorming for a bit, I decided some mini peach upside-down cakes would be cute, not too fancy but still impressive, and most importantly, mighty tasty. I can’t remember if Adam helped or not. Maybe he stirred the batter for a while… Anyway, here they are with nectarines this time. 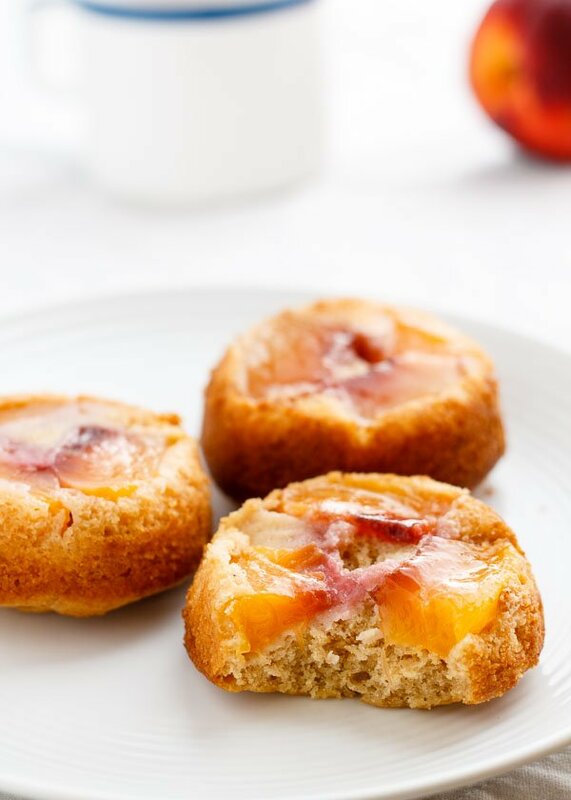 You can use either peaches or nectarines, as long as they aren’t too ripe. The fruit will soften in the oven, so you want to start with crisp, firm slices. I made these in muffin pans. 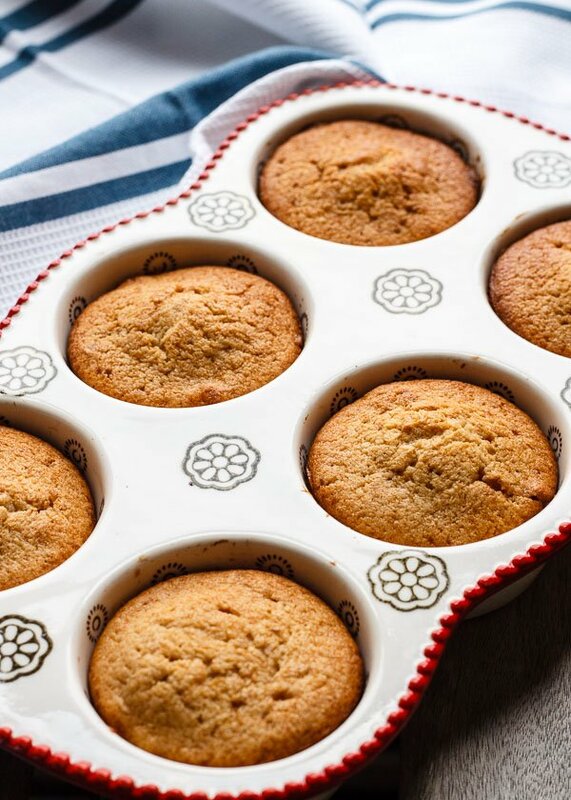 You’ll get about 8 out of a muffin pan and 10 out of a cupcake pan. 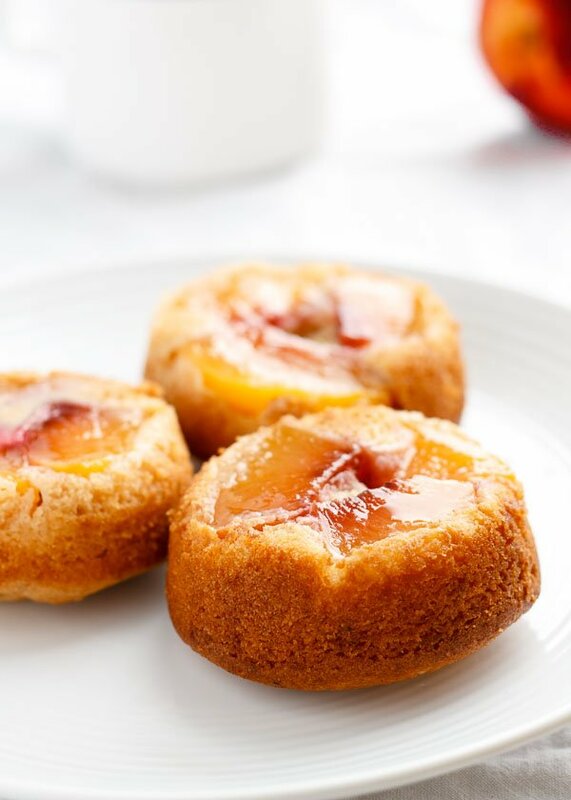 I highly recommend lining each muffin cup with a wide strip of parchment paper so you can lift the cakes out without losing any of the fruit, which often sticks to the bottom of the pan. They are best served warm (even hot!) but they’ll also keep in the fridge for a couple days. Hope you make some with the last batch of summer fruit! Generously grease two muffin pans and line each cup with a strip of parchment paper 2 inches wide by 8 inches long. 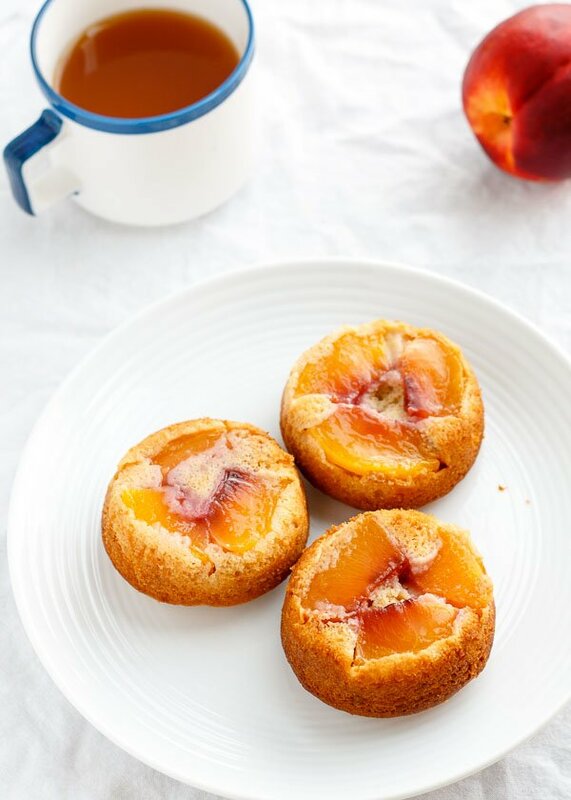 Arrange the sliced fruit in a ring around the bottom of 8 muffin cups. You may need to cut the slices in half to fit. In a mixing bowl, cream sugar with butter until light and fluffy. Beat in egg and vanilla. Whisk the flour, baking powder, and salt together, then add to the creamed mixture alternately with milk, beating well after each addition. Spoon the batter over the peaches. Bake for 30 minutes, rotating the pans halfway through, until the tops are golden brown and a toothpick inserted in the center comes out clean. Cool for 10 minutes, then slide a knife around the edges to loosen the mini cakes. 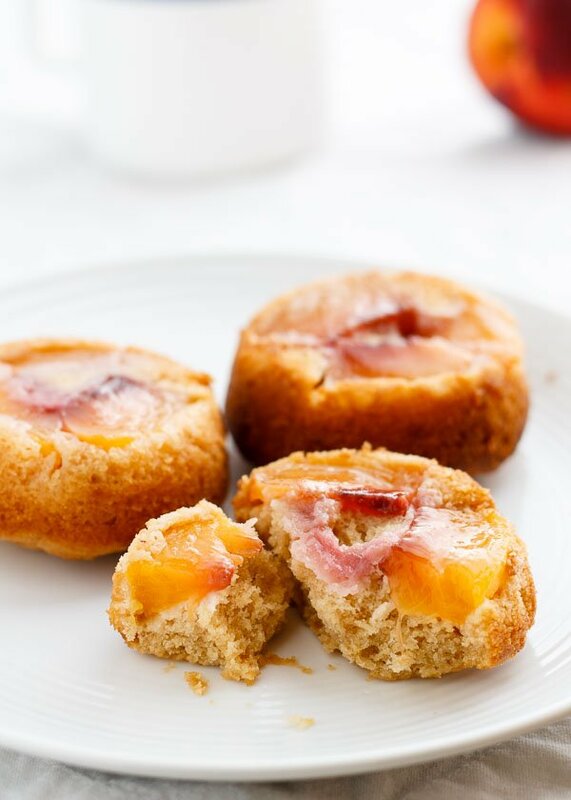 Lift them out using the parchment paper and flip each cake over so the fruit is on top. Peel off the parchment paper and serve immediately. Beautiful Beautiful mini cakes!! 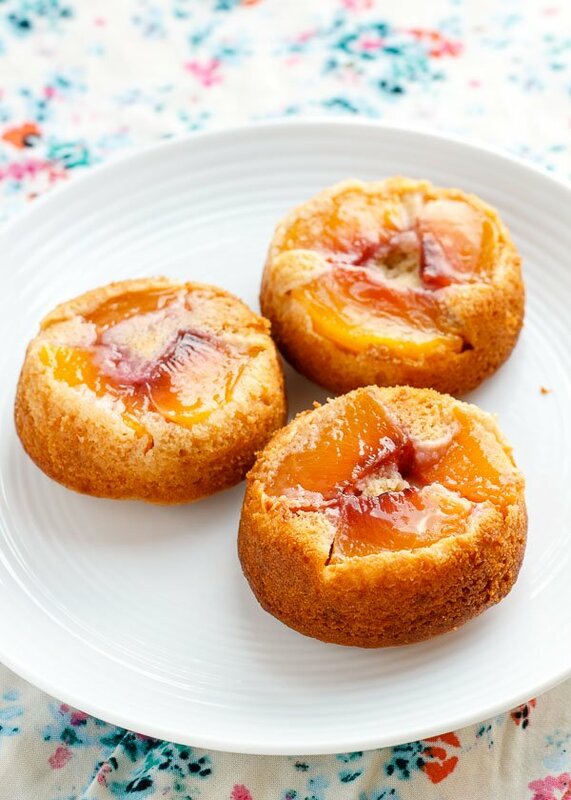 they look so cute.. Love peaches and these are just too good.. YUMM!! 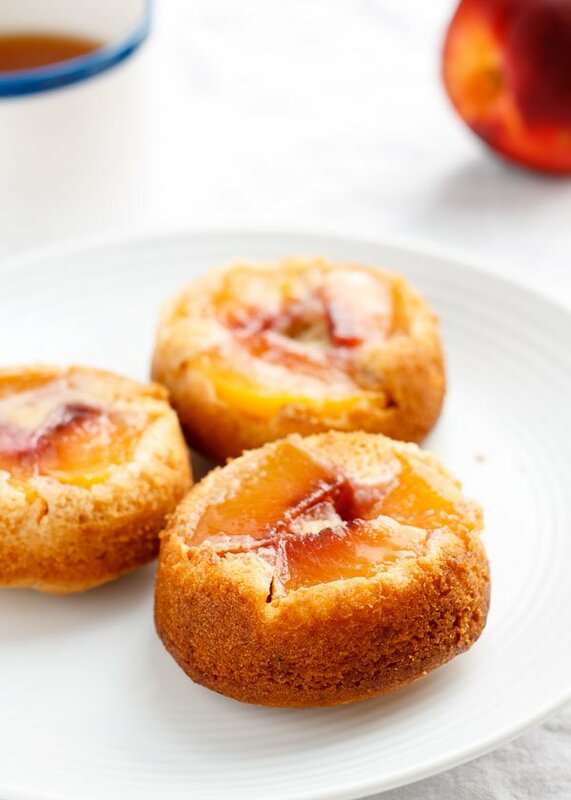 I love upside down cakes but have never made mini versions before.. great idea! I definitely need to recreate the recipe.. they look incredibly delicious. I hope one of these is coming in the mail for me. I eated all of dem! I love this – so pretty!